Hi, Friends! Today is Practically Speaking. And I have a topic near and dear to me and my home. 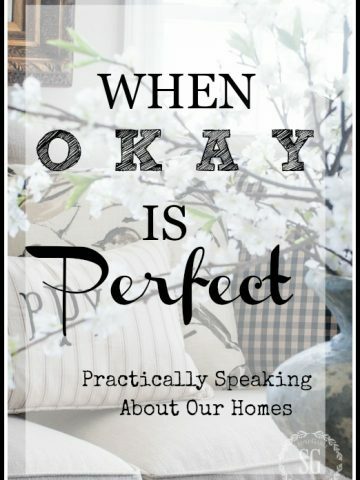 Did you know there is no such thing as a perfect home? However, so many home decorators strive for just that. No wonder we get frustrated and even embarrassed about how our home looks sometimes. Many of us are under a false illusion of what we expect our homes to be. Today let’s talk about the real and authentic ways we should measure the worth of our homes! First, we need to face the fact that our homes are not p-e-r-f-e-c-t! No one’s home is! Especially if the measurement of home perfection is perfectly decorated, perfectly organized, perfectly pristine, perfectly decluttered, perfectly perfect all the time. And for many of us, if we are truly honest, strive for this type of home perfection. Let’s admit right off that there is NO SUCH THING AS A PERFECT HOME. Because by the very nature of living in a home. it will be imperfect! Then, how should we be looking at our homes? What is the standard? If a home is not every really perfect what should we be striving for in a home? I think a home should be perfectly imperfect! How about creating a home that is WELCOMING or TIDY or COMFORTABLE or WELL-LOVED or CHARMING? Those are much better standards for measuring a home! We create homes to be a sanctuary for all who live in them. To find solace from the outside world. We entertain in them, love in them, eat in them, sleep, create, relax, talk, grow, laugh, cook, cry, work, play, lounge and everything in between. How could we ever have a perfect home? Let’s free ourselves from that fairy tale of perfection. Yes, we want neat, clean, organized, comfortable, lovely homes. Yes, we want to appoint and decorate them the best we can. But we should stop our striving there. Our need to impress others and our need of control should have no voice in creating a home to be proud of. Goodness, this is so hard for us. Our homes are deeply attached and rooted in our self-esteem and the fiber of who we are! I honestly don’t know if I can totally shake that perception. Decades ago, when we lived in our first house, when we would have company for dinner I would clean the entire house, do all the laundry and wax and buff all the floors before I cooked one mouthful of food. This routine got immensely tiresome, as you can imagine, and I started wanting company less and less often. No wonder! It was too wrapped up in myself and how others perceived me through my home to care more for my guest than myself. What a selfish and self-centered way to live! I have a friend who I have known for over four decades, who will remain unnamed, who’s home is… well, a little disheveled. But her home is one of my favorites to visit. It has this magical power over me. I can’t wait to visit and when I do I feel so welcomed and safe and loved and I certainly overstay my visit. It’s a hard home to leave! This is a perfect home to me! My friend is calm and attentive and authentic and gracious. We talk and “go deep” and laugh and I love her and her home more and more every time I am in her home! Who wouldn’t want to be in her home? I could care less that her home, although clean, is never quite straightened up and put together. It was then I decided that my standard of a perfect home were going to be things like comfort, beauty, hospitality, joy and love! Because they are the best and most tangible way to create a home that is a sanctuary for all! My home could look imperfect and still be perfect to me. What you see on my blog IS my real life, but it’s only a slice of my real life. Blogging is a very messy business. But if I can invite you in, in front of the cameras, and make you feel welcomed and comfortable and loved then I feel my home is perfect. If I can give you ideas and tips and make your life more creative and filled with joy and a “can do” attitude then I feel I’m reaching my goals. But remember, StoneGable… and any other home you see on a blog or in a magazine or book, are real homes. You might see our homes in perfect shape for that moment. And for that moment, they may be. But, at least here at StoneGable, we are perfectly imperfect! We are real and messy and unorganized at times. And that is perfectly okay! I have given up home perfection because I could chase that illusion the rest of my life and never come close to achieving it. And it’s exhausting. And you should too. Let’s relax and work to achieve a home that is comfortable and beautiful. Not perfect. A big YOU GO GIRL to all of you who have perfectly imperfect homes!!! I wish I would have read this post before I sent my sofa out to be reupholstered for the second time this year. p.s. I love, love, love that painting behind your couch with the white buildings a two trees. I always make my bed unless my 3-year-old grandson is visiting! Then I remember what the wise Erma Bombeck said: “No one ever died in sleeping in an unmade bed!” She also encouraged mothers to spend time talking to their children and remember the dishes will still be in the sink afterward. It was so hard as a mother to get everything done before going to bed. However, as a grandmother—playing is much more rewarding! I stopped reading a lot of blogs, for that reason. I felt my home would never be like some of those bloggers. I love my home, as imperfect as it is..
I’ve cultivated the mindset of not comparing but being inspired. My home will not be perfect at all! I can find little ideas and ways to decorate it looking at the beauty others create in their homes. I hope you are inspired by StoneGable, Barbara! I tend to feel more welcome in homes that are not absolutely perfect! I remember one time I brought my boys to a neighbor’s house right after her cleaning people had just finished. She made sure they boys had their shoes off the second we walked in the door and she must have mentioned several times how “the cleaning people were just here”. We didn’t exactly feel welcomed as we walked in. I would much rather visit a friend who welcomes us with her kindness and hospitality than with a clean and perfect house any day! Great post! I am often thinking of ways to improve my home. I love my home, but still am always thinking of ways I couerld make it better, more comfortable, etc. For instance, I have a LARGE t.v. ABOVE my mantle in the living room. It also has a background of stone behind it. It really is the only place for the television, so placement options are out. I DO like my living room, BUT could use some good ideas for hiding the screen while not watching! Ideas?? I always enjoy your blog, however today’s was wonderful! I have also been guilty of trying to make my home perfect for guests but forgetting the warmth. As we are caring for my 3 year old granddaughter while her mother is deployed, perfection is not a goal, just that warmth, love and feeling of safety. Thank you! Thank you for raising a daughter who is serving our country and the sacrifices you are making! Know I pray for you and am so grateful deep down in my heart! God bless you and your daughter and her family! I’ve been guilty of the same thing, not wanting to invite company over because my house was not perfect or because I had to spend three days in a cleaning frenzy. It got to where I hated to think of people coming over. Thanks for reminding me that things don’t have to be perfect. I would also like to ask, what type of plants are the pair of tall, skinny topiaries? I’ve really enjoyed your blog over the years, Yvonne! 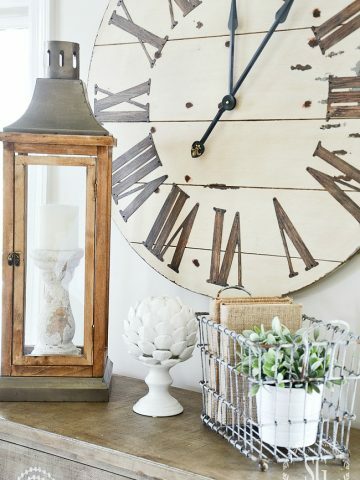 I know you are trying to keep up with trends and not have your home look stale, but honestly, I really liked your house best when I first started following your blog. It just doesn’t have “the look” I so enjoyed. (Of course, I realize that’s my opinion, and pleasing every person will never happen.) You are an amazing person, and I don’t see how you do what you do, even with an assistant. The menu for a week is always interesting to see! Thanks. Thank you Yvonne for such a well written piece this morning! We all need to be reminded occasionally to focus on what is really important, people versus perfection! I love order & cleanliness, but our lives would be sad and incomplete without the relationships we foster with friends and family. I can always count on your blog for great classic decorating, delicious menus and solid advice. I know when I see your an email from Stonegable in my box I’m going to learn something today! I love this post Yvonne! Thanks for the inspiration with a dose of reality! I think your site has been hacked as I see your photo with Stone gable under many posts that are unconnected to you! When I tap on the post to view it, the topic is something else totally and the wording seems to be strangely oriental in grammatical style. I find this happening all over Pinterest these days! I had saved a couple of your posts from months ago and was able to get to here to write this in your comment section. When it comes to pinterest that’s okay. People are allowed to pin my images with my post. Other than that it is illegal unless I give permission. But Id’ spend all my time chasing them down. And I have posts and other things to do with my time. Thanks for letting me know though. This was a fantastic read! I really enjoy seeing spaces like yours and knowing that they don’t always look so perfect! It is good to know that somebody moves the mess around to get those great blog and Instagram photos. 😉 Thank you for making this post “real” and giving us a behind the scenes dialogue to your perfect photos. You get it! Yes the images look great for the pictures, but behind the scenes sometimes it’s a bit of a mess! Perfection to me is a home where everyone feels welcome and comfortable! 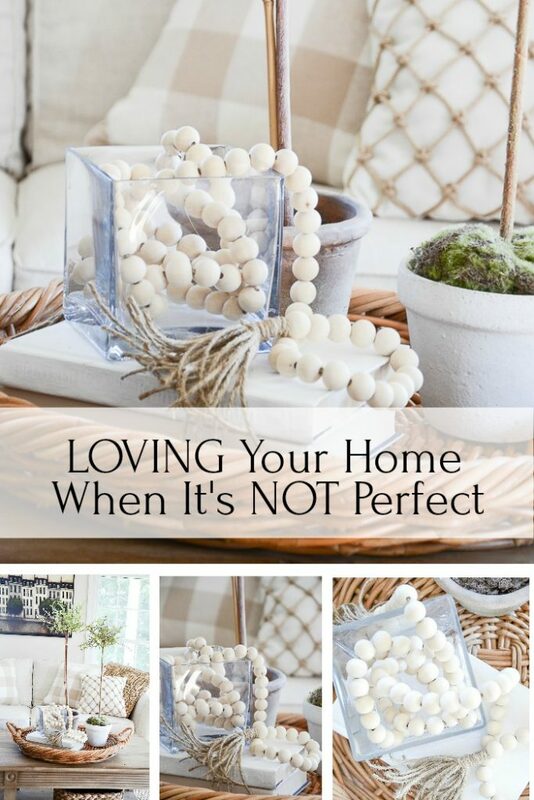 Your home looks pretty “perfect” to me! Love your style! Yes! I need that reminder to find the balance between order, and a home that’s just comfortable and welcoming. You hit the nail on the head! Such a sweet story. I really enjoyed reading it. Thank you for being transparent. This is something I could stand to hear again and again. I cannot find the e-mail where you told us what your wall paint colors? very wise words… one of the nicest things anyone has said about my home recently is “you have stuff that no one else has…” which being interpreted means, things from flea markets, repurposed items, ironstone collections, and stuff just gathered from here and there … and it is all interesting. But definitely not perfect! I have a sign done by a friend in beautiful hand-painted calligraphy which says “Life does not have to be perfect to be beautiful” To that i say AMEN! Great post, I would love everything to be perfect, but…unrealistic….I am great cook, a fair cleaner (having two knee replacements last year compromises my cleaning baseboard abilities) so candlelight is my friend and flowers!!!! I really enjoyed this post. Your words are so true. Whenever I am invited to a friend’s home, I do not critique if a little dust is on a table or two, if the rug or an armchair is a little threadbare in spots, nor do I care if everything is perfectly color and/or style coordinated. I enjoy the pleasure of my friend’s company and hospitality. If I waited until every room in my home was prefectly spotless, everything in it’s place, and looked like a magazine layout, I’de never open my home to anyone. Although knowing that family and/or friends are coming over is a great motivator for me to make sure my house is clean (as best I can) and straightened, I so agree that I also would never invite family or friends over if my home has to be perfect. Your post is wonderful. I feel like many of your readers, greatiful to have a roof over our head first, secondly, I try to make our home comfortable for all who enter, be that they live here, visiting, or just dropped in fr a few hours. I wnt them to feel as though they are home, yet keep our home clean, and somewhat beautiful. I realized I cannot achieve the beauty of your gorgeous home, but greatiful what we do have. As always, thanks for your uplifting beautiful posts. To me it’s all about balance. I have shared the thought “it’s good enough” with a younger homemaker who aspires to perfection yet struggles if she doesn’t achieve it. An example I’ve shared with her is daily making our bed. Each day when I make the bed, my mindset is – it doesn’t need to be perfect – the bed throw pillows DO NOT need to be exactly perfectly in place, because each night the bed will once again get unmade. However, if I’m going to be showing our home to someone for the first time, I will take more care making our bed. Balance!!! It would be nice to see a bloggers pictures after a dog has run through with muddy feet or a husband has left his socks and shoes (that don’t match the decor) by a chair and people actually utilizing the space with company and the pillows disheveled! Thanks for the laugh, Jill! inscription written inside the cover of a book titled ” The Perfect Home.” The book was in a professional’s lobby and probably a gift from the author. I don’t know or remember the author, so I can’t give proper credit to his quote, which was “The perfect home is the one you are happy to come hone too.” I love the quote and am thankful to the author. Thank you. Thank you. Thank you. I am one of “those” that stress over my house and the reflection it is on me when it is not clean. I look at Pinterest and the lovely ideas and gorgeous homes and then look at my house and hang my head. I will STOP from this moment forward and be gracious and thankful for all that I have and for the way my home is decorated right now!! Thank you too, for sharing your beautiful home. I adore your attention to detail and your style. Thank you for all of your tips and advice and of course….the recipes! You are a peach! I hope you have a wonderful afternoon. May GOD Bless you and yours! Tricia B. Very interested in a cabinet similar to yours shown in the living room. Could you share where it was purchase? I could use the extra storage. What a lovely post Yvonne. And one I must remember. It is hard when you love decorating, and you are a perfectionist! However, what happens in the home and the people who live there are much more important than how it looks. And I think we all know that in our hearts! Pero tu casa es perfecta, hermosa, ordenada, ya quisiera yo que mi casa fuera la mitad de bonita! Adoro cada rincón de su hogar, y te felicito por tu blog, que me tiene enamorada. Un gran saludo. You are a very smart lady…I use to stress when company was expected but have eased up a bit on trying to have everything look perfect. I wish I would of learned early on that my friends and family didn’t care about how my home looked like, they were there to visit and have fun. I hope a new bride or mother reads your post and and remembers its truth when they are expecting company. As eyes get older, I can’t always see the dust so hopefully my friends can’t either. Your house always look immaculate, Yvonne. You know the trend for showing models in all shapes and sizes? Would you make us feel better and show a pix of a messy kitchen or bathroom in your house at some point? No way! People come to my site to see pretty things. When I do a remodel, I show the before. Love the posts. We had company for dinner last night and one of the greatest compliments two of the ladies ever gave me was that they loved coming to our home because it was so peaceful. Of course I pick up a bit before company but always vacuum after they leave because they are welcome to walk around with their nibbles and drinks. I have always thought your place was great. I have a really little house and I just cannot seem to get it where I want. Money is the biggest problem.So Ill work with what I have .And Relax and enjoy. I think that is a great plan and attitude! Your home is so gorgeous and I strive at working to have mine look like yours (or similar) someday! Thanks for all your beautiful posts! I love this post! For years I struggled thinking I needed to keep the “perfect” home. What I found was that I actually ended up alienating some of my friends. They felt they couldn’t compete, so they stopped asking me to their homes. Sad, but true. As I have gotten older, I realize they are coming to visit with ME, not to critique my home and how well kept or decorated it is. I have a friend similar to yours, she helped me to see it is about love, comfort, fellowship, friendship and yes, hospitality. My interim pastor’s wife gave a talk and something she shared was something her sweet mother in law shared with her. “Honey, why are you cleaning and scrubbing for your guests, just for them to mess things up, clean afterward and enjoy it for yourself!” AMEN!! Yvonne, I can’t wait each day to refresh myself by reading your blog. 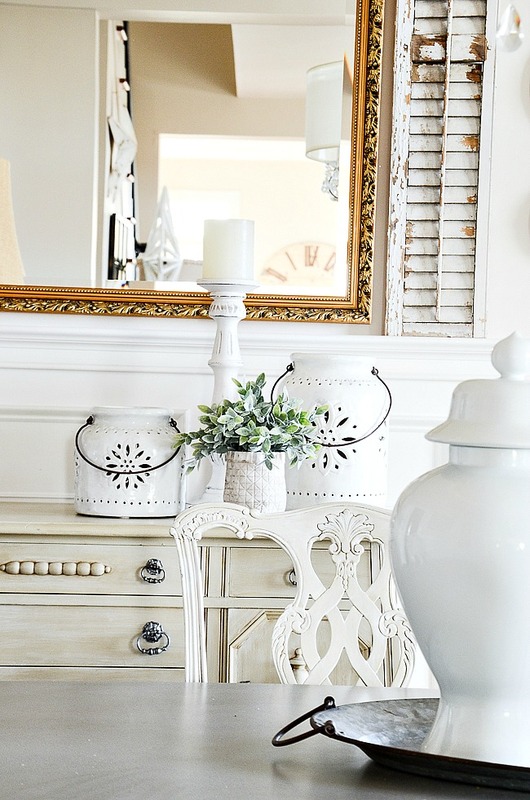 Our decorating styles are similar and I glean so many wonderful new ideas. I especially like the winter door wreath made of old sweaters: I will be making one! Thank you for the very sweet comment Tamara! Your pastor’s wife gave the perfect advice, Lauren. Thanks for sharing. I was the very same fussing and cleaning before company and would be exhausted by the time they arrived. However, over the years, I’ve realized that I don’t notice a dusty sofa table or floor when I visit someone, so perhaps, company doesn’t see my dust. As long as kitchens are clean, toilets and sinks clean, I am (gradually) letting go of maintaining a perfect home. It is imperative to me that my guests feel welcome and from time to time, after doing some new vignette or decor change, I critique the room/chair/space and judge whether a man would feel at ease in the room. Women seem to have the ability to perch daintily here and there but men with their larger bodies, longer arms and legs just can’t do the same. So while decor is a big love of mine, having guests feel at home is more important! That was such a good post, Yvonne, and so true! It’s easy to let our homes become an idol and to even find our worth in them. I know I’ve fallen into that trap before. My focus has now changed to serving those in my home and making them a priority instead of the decorating, as much as I like fluffing my house. I still do but the importance is no longer on that as much as on the ones I love. As Christians we’re commanded to be content with what we have, but it’s so easy to covet, isn’t it?! I really have to remember this when looking at blogs – I love yours! – and magazines or shows on HGTV. I think it was Microsoft that came out with the expression “WYSIWYG” (What You See Is What You Get). Like others, I, too, wanted a well-put-together home; however, once babies came along I realized that was a wish. I can clean and tidy up if I KNOW ahead of time that company is coming, and if they just drop in and I’m ironing then I make a cup of tea and we visit until I at least finish the item I’m working on…nobody seems to mind. There is always some part of the house that needs attention and I’m comfortable enough to visit with some disarray (not dirt, mind you) around me. A cup of tea and always some home baking with a friend makes this house a “home”. Love your post. Your thoughts also create a stress free space, both for you and your guests. Be blessed!! 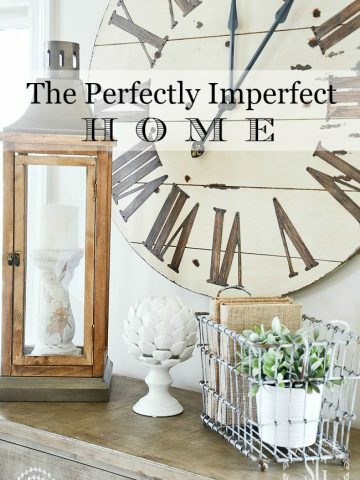 I embrace the perfectly imperfect home! Our home is a direct reflection of our tastes and way of life. It warms my heart when friends come by and say ‘your home is so you’. But like me, us, the décor is fluid…always changing. With the seasons, on a whim, as we fall for something new…. But with a 70 lb chocolate lab and LITTLES, there will always be something homey about it. That’s the something that makes it home!! The come on in have a drink and prop your feet on the coffee table vibe! Thank you for this post. I’m currently in the process of remodeling a new home and the stress is taking its toil on me. I see all the posts on Pinterest and know I can never measure up to those perfectly decorated homes. When people come to my home, I try and remember this: Strive to bless, not impress. I am thankful to have a home, when so many people in our broken world do not have a place to lay their head. If your home is one in which your husband, children, pets and guests are constantly worried they might break or mess something, then you’ve decorated for yourself, not them! Fabulous post. I might strive for perfection in my home but with a husband who loves to collect things, two dogs and five children I am never going to achieve it! It can look immaculate for five minutes but then someone will leave something lieing around, a new project will be started at the kitchen table or the girls will decide to do some baking and it’s messy all over again! But, like you friend, it is far more important for me to have a home where people feel welcome, where they can pop in at any time of day for a cup of coffee, a glass of wine, where they feel warm and cosy and where they never want to leave. That to me is the essence of a real home. Now you’re talkin…we’re just blessed to have a roof. What a wonderful post. I also used to do the whole top to bottom clean but not anymore. I really don’t notice if someone else has cleaned or not when I visit them. I have come to see them not the house and further more if it is untidy it’s not my problem. Thanks for the good advice. Perfect post!! I agree 110%, Yvonne. I have fallen into the same trap of wanting everything completely perfect about my home. Or, I at least I wanted anyone who entered to get that impression. You know what cured me? I overheard two ladies talking about their last visit to my home. One said, “I went to the restroom and thought, I know no one ever takes a bath in this tub.” The other said, “I know, every time I visit, I feel like I am in a museum and mustn’t touch anything ” Well, Yvonne, it broke my heart. But, it taught me a very important lesson. Even though I want my home to be tidy and clean when company arrives, the most important thing is how I make them feel while they are here. And, how I feel when they walk out the door. I want them to desIre to linger long and yearn to return again and again. Thanks, Yvonne! Your time was well spent on this post! You are a wise woman! Have a memory making weekend with your house guests. Sherry, I commented below but have to totally agree with you. It really is eye opening when you find out how your friends truly felt in your home!! Well said Yvonne. Love your home, perfect or not. It is nicely put together and inspiring to me. Have a beautiful weekend.